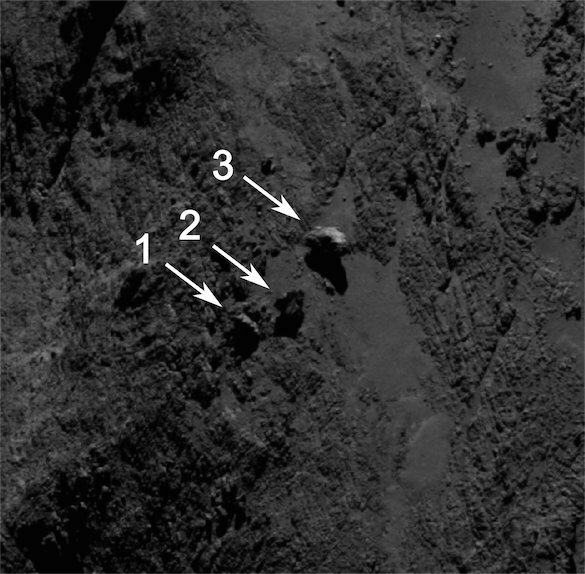 The scientists of the Rosetta space probe’s OSIRIS camera’s team discovered a curious rock formation in the region called Aker of the comet 67P/Churyumov-Gerasimenko. They look like the balancing rocks existing in various places on Earth and precisely these are three rocks that seem to have very little contact with the comet’s surface. The three balancing rocks were already discovered last year examining various photographs taken with the Rosetta space probe’s OSIRIS (Optical, Spectroscopic, and Infrared Remote Imaging System) instrument but initially they didn’t look different from other rocks. The lighting and the angle of each image can change significantly the way they are interpreted so this study was carried out on various photographs taken taken at different times. These strange balancing rocks are located on the largest lobe of the comet 67P/Churyumov-Gerasimenko, in a region that was called Aker. The largest rock, labeled with the number 3 in the images, has a diameter of about 30 meters (almost 100 ft). On Earth, this kind of rock is the result of erosion and other geological processes that created a rock that barely touches the ground. 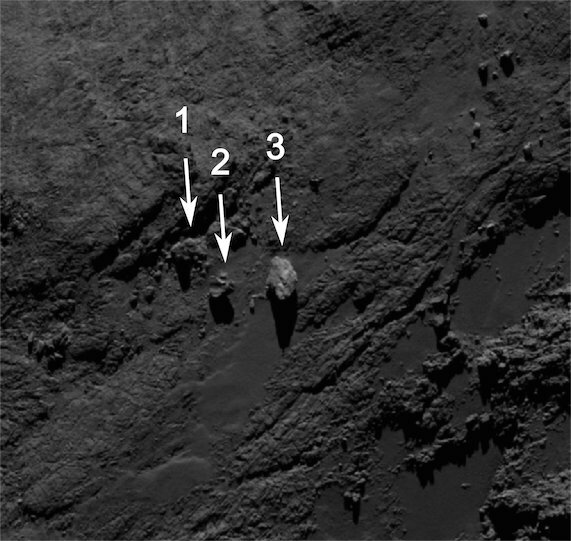 The origin of the three rocks on the comet 67P/Churyumov-Gerasimenko is unclear. On Earth, there are winds and sometimes there may be glaciers that cause the rock erosion. On the comet there are only jets of gas and dust in the periods in which it approaches the Sun enough to cause the sublimation of the ice water it contains. Considering the strange shape of the comet 67P/Churyumov-Gerasimenko, it’s possible that there were very significant erosion phenomena. It’s not yet established whether there’s one nucleus and was eroded so much as to create the current shape with two lobes connected by a neck or there are two nuclei that merged in the past. In any case, on the comet 67P/Churyumov-Gerasimenko there was a considerable activity in the course of its existence so the presence of balancing rocks is a surprise but nothing shocking. Rocks of that kind may exist on the Earth defying its force of gravity, on a comet gravity is minimal so the balance is more stable. ESA scientists intend to continue studying these balancing rocks to try to understand better their nature and origins.